Anyone who says the book industry is dead has never been to the Frankfurt Book Fair! 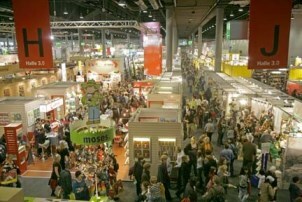 During the 2013 Fair, held October 9-13 in Frankfurt, Germany, over 7,300 exhibitors and 276,000 visitors convened in Frankfurt’s Messe (Messe = “Fair”) for international conversations about the book, both public and private. IBPA’s COO, Terry Nathan, was on hand to talk with foreign rights buyers about the 133 titles featured in IBPA’s cooperative booth. Over the course of the Fair’s three professional days, he met with buyers from 24 countries and recorded 112 requests for book copies to consider for foreign rights purchase. The photo right shows the IBPA cooperative booth (and Terry’s “desk”) before all the meetings made a mess of it! At the same time, I was busy meeting with potential IBPA benefits providers and partners. The tenor of my meetings can be summed up as, “We can cooperate, not just compete.” Everyone I spoke with seemed generally interested in helping to bring increased value to your IBPA membership. More on IBPA meetings later. First, let’s explore three major themes from the Fair. No. 1: Digital – What Else? No matter what country you live in, if you work in the book business you’re grappling with the digital transition. Some countries are more advanced than others, but everyone has a point of view. That said, whereas in year’s past the digital conversation could feel quite panicked, the mood at Frankfurt in 2013 was much calmer. Yes, the “future of the book [might be] on the web,” as Sasha Lobo from SoBooks (photo right) told us during his keynote address at the CONTEC Conference, but that doesn’t mean we’re in need of a fire sale. Several years ago, I started talking about what I saw as the “Angry Birds Problem”. This was the idea that as more and more readers gravitate away from dedicated reading devices – whether this be a print book or a dedicated e-reader – to multi-use tablets, book publishers will begin to compete not just with each other, but with a whole host of mixed media options. Angry Birds was the culprit de jour at the time. It should be noted that, according to Fine, 25% of Amazon’s top 100 sellers are self-published e-books. I was thrilled to see that most people I spoke with acknowledged self-publishing to be, less and less, a vanity affair. It’s hard to get statistics on the U.S. market, but Books on Demand’s Florian Geuppert presented results from his survey of 1,800 of their 25,000 authors in Germany, Austria, Switzerland, Germany, and Scandinavia. About 1/3 of the 1,800 said they made a conscious choice against traditional publishing. It seems that, more and more, self-publishing is becoming a viable option, rather than just a fallback option. Even though 276,000 visitors was apparently a 2% decline from the year before, you could still feel plenty of energy on the Frankfurt Book Fair show floor (photo left). At the end of day, of course, Frankfurt is essentially a place to come if you’re in the market to buy or sell book rights. In fact, the chief responsibility of Terry Nathan, IBPA’s COO, was to present IBPA member titles from our cooperative booth to foreign rights buyers. One hundred thirty-three (133) IBPA member titles were showcased this year. A complete catalog is available online and will be sent in a follow-up email to all IBPA’s foreign rights contacts. Each meeting with a foreign rights buyer lasts 15-30 minutes. The first thing to be done is to get a sense of a particular area of interest. Interest areas are generally very narrow. Sometimes we have many titles for them to consider; sometimes just a few. In rare cases, we won’t have anything at all. But, like everything else in this business, it’s a matter of building relationships. Selling your rights to an international buyer can be complex, but extremely rewarding. For those of you with interest, there are several articles previously published in IBPA’s Independent magazine about the beginning, middle, and continuing stages of working with international publishers. In addition, IBPA members can download a sample form for help developing a contract for licensing foreign and translation rights by a U.S. publisher to a foreign publisher when the U.S. publisher controls foreign and translation rights in a work. See the Foreign Rights section of our Membership Benefits Handbook for more information. While Terry was busy with rights agents, I was able to meet with IBPA member benefit providers and potential partners. 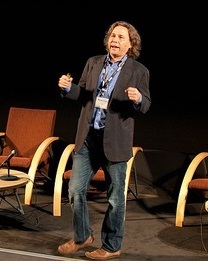 In the photo right, for example, I’m meeting with Apple’s Ian Wallace. People were incredibly generous with their time and ideas for collaboration. We look forward to rolling out some new projects in the coming year directly steaming from these conversations. 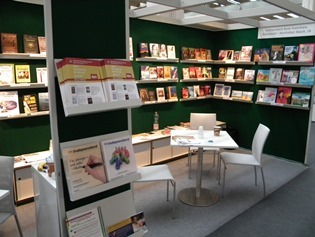 IBPA is extremely privileged to be able to represent our members’ titles at the Frankfurt Book Fair each year. We’re equally privileged to be joined by those members who choose to purchase a private or shared booth through IBPA. Special thanks to Ethan Atkin of Cranbury International, Thierry Bogliolo of Findhorn Press, Pat Conte of Gryphon House, Jean Trumbull of Impact Publishers, Susan Sewall of Independent Publishers Group, Stephen Buda of J. Ross Publishing, Maria Kjoller of Lerner Publications, Mary Rudd of Llewellyn Worldwide, Dorothy Smyk of New Harbinger Publications, Jessica Tribble of Poisoned Pen Press, Jim Schmelzer of PSI/Publishers Services International, John Atkin of Silvermine International, and Valerie Pierce of Sourcebooks for signing up to host a booth with us this year. We hope to host you again in 2014! 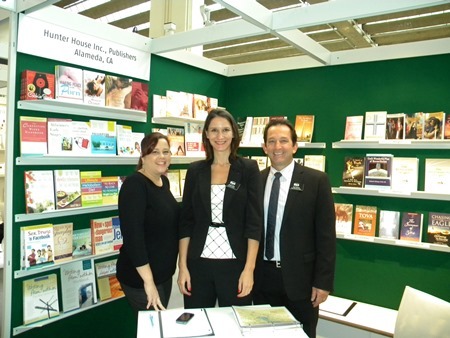 Photo above: The 2013 Frankfurt IBPA Booth Crew (l to r): Bronwyn Emery (Publishing Assistant, Hunter House), Angela Bole (Executive Director, IBPA), Terry Nathan (COO, IBPA).